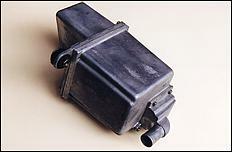 All cars vent the blow-by gases through into the intake system. Huh, what's that mean? 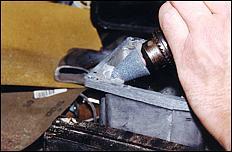 When combustion occurs, there is some leakage past the rings and so down into the sump. 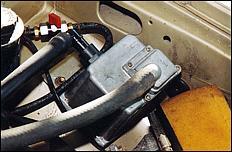 This pressurises the sump a bit, with these gases making their way up to the top of the engine. 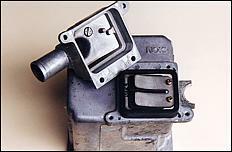 The oil/air mist is drawn off from the rocker cover and directed into the intake, where it's sucked the engine and burnt. 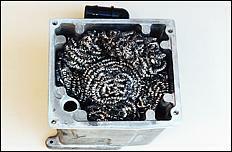 However, in a high performance engine, this has two associated problems. 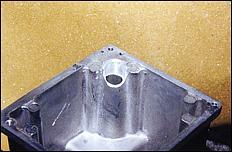 Firstly, the contamination of the combustion chamber with oil increases the probability of the engine detonating. That's because adding oil to the fuel/air intake charge doesn't do much for the fuel's effective octane level. Secondly, in turbo cars, the inner surfaces of the intake system - and most importantly, the intercooler - get coated with a thin layer of oil. This doesn't do much for the heat transfer capabilities of the intercooler. So stopping this oil going back into the intake has some benefits, especially if the engine is breathing a lot. Directing the crankcase breather straight into the air (ie by pulling off the hose going to it) will cause the inside of your engine bay to be coated with a thin layer of oil after a while, not to mention polluting the atmosphere. And putting just a filter on the breather will soon cause the filter to become clogged with oil. So whadda do? 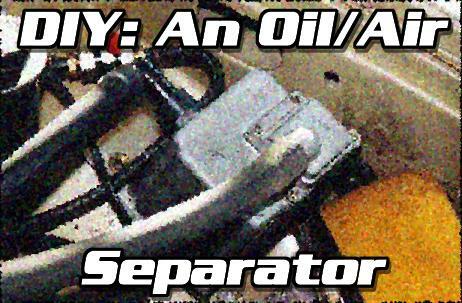 Build an oil/air separator, that's what! 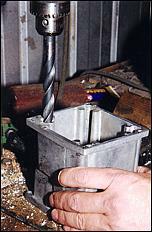 Often these take the form of welded-up alloy containers, but not many people have alloy welding facilities in their home shed. So we've put together a design that can be built using just a few hand-tools. It's also very cheap. Depending on whether you opt for polishing, powder-coating, plastic fittings, brass fittings (etc, etc) it will cost anything from under A$10 to maybe A$50. 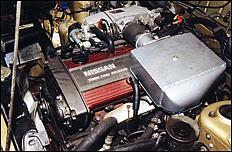 Each rocker cover of this Nissan RB20DET is vented directly to the intake system. 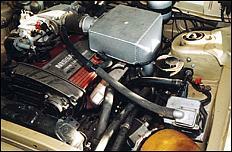 The breather closest to the camera vents straight into the intake prior to the turbo, while the hose that connects to the plenum chamber has a one-way PCV (positive crankcase ventilation) valve in it. 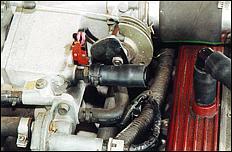 So as you can see, all blowby oil/air gases are inhaled and subsequently burnt. 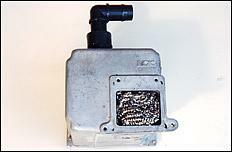 This is basis of the separator - the cast aluminium pollution control system canister from the front left guard of a KH Ford Laser. While we haven't checked, we'd expect the same canister to be in the Mazda 323 equivalents, and probably also in other Laser models. In a front-end collision, these containers easily have their mounts broken, meaning that a car at the wreckers with minor frontal damage probably has one in it which is available for nearly nothing - ours has a broken mount and cost the grand sum of $0. If you live in countries where early-Nineties FWD Ford Lasers and Mazda 323s don't exist, you may be able to find something similar in another car. So why'd we pick this box? Well, it's got heaps of advantages. Firstly, the container (we don't know quite what its official Ford/Mazda name is...) separates into two halves. (We only use the top half.) Secondly, one half (yep, the top one) has a nice ¾ inch hose fitting. Finally, the cast alloy is of superb quality - easily polished, drilled, powder-coated... whatever you want. Incidentally, note the broken mounting lug - the reason for the zero cost of the acquisition. Under the detachable hose mount on the top half you'll find this fancy double reed valve. This valve isn't used in the AutoSpeed design, but you may be able to find a use for it in an alternative version of this project - or even in a totally different project! So, remove it and put it to one side for other ideas. 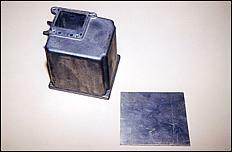 As we said, just the top section of the canister (the bit containing the hose attachment) is used in the oil/air separator, with a new base to the container made from sheet aluminium. Here the shape of the new piece is being traced onto the aluminium. The new alloy floor is made from 3-4mm thick alloy sheet, very cheaply obtained as an off-cut at a non-ferrous scrap metal dealer. 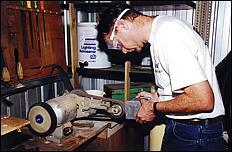 You can cut out the new piece with an electric jigsaw, or even just with a hacksaw, as is being done here. 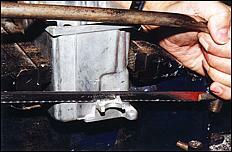 If you place the material horizontally in a vice, cutting a straight line with the hacksaw is easily carried out. 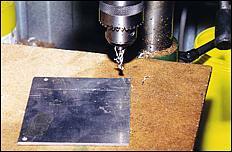 So, a piece of alloy sheet forms the new base of the container. But it'd be nice if it had holes in it so that it could be screwed into place, wouldn't it? 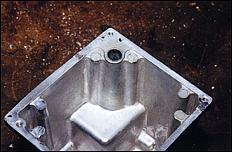 Using the top half of the container as a template, mark the location of the holes. After you've done that, drill holes that are the right size to take the (provided) screws - make sure that you put the holes in the right places! When you finally attach the bottom plate for the last time, run some silicone sealer around the mounting face so that oil later can't leak out. With the new floor to the container temporarily screwed into place, a belt-sander can be used to give a neat edge all round the base. Alternatively, a file and elbow grease will achieve the same thing. If you've been building the unit as you've been reading, about this time you'll realise that there's a problem. The provided hose fitting connects to an internal metal passage that takes the air down to the base of the container - slap, bang into the new metal floor that we've just added. So how's the air/oil mix going to even get into the box, let alone separate? The first step in fixing this problem is to use a drill bit slightly large than the internal diameter of the passage, to open it out for the first 10mm or so. 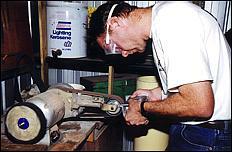 Use too large a drill and you'll cut through the wall of the container; use too small a drill and the next step will take you ages. Now that you've created a thin wall, use a file or grinding stone in an electric drill to take away part of the wall to the feed tube. When you've done this there'll be a nice opening from the feed tube into the container itself. See, told you that the alloy 'works' beautifully! ... and then sand away any remnants of it. 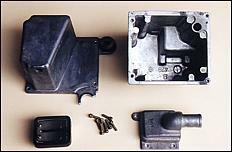 If you want to polish the box, or paint it, or powder-coat it, now's the time. 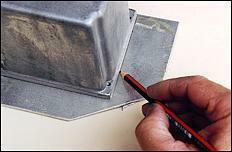 The filter medium used inside the separator comprises stainless steel kitchen scourers. 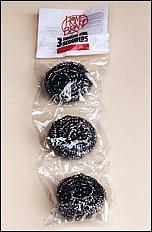 These can be quite expensive, but we sourced 'home brand' examples from a local supermarket for just 70 cents a packet. We bought five packets. Make sure that the scourer material is fairly hefty, so it's not gonna fall apart due to vibration. ...followed in our case with the insertion of a few in the upper compartment of the separator. If you wanted, you could put the filters in just one or other of the two spaces. 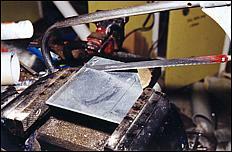 The separator was mounted on an alloy plate, bolted to both the separator and the inner guard. Remember to install the mounting bolts before you pack the separator with the scourers and seal the bottom plate into position! 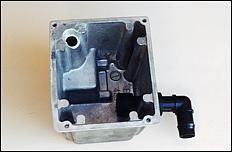 If the original breather had two inlets, block off the one that is no longer used. And how often will you need to empty the separator of caught oil? That will obviously depend on the amount that the engine breathes, how big the engine is, and how hard the car is driven. But if the engine oil blow-by is small, we'd think that cleaning out the separator may well be an six-monthly or annual event.